What's the first thing that comes to mind when you hear the word leggings? Likely, you associate the casual, comfy bottoms with go-to home or gym wear, which is definitely not wrong. But, in recent years, the fitted, stretchy bottoms have become a serious street style staple, as well, and working them into your everyday look without appearing too underdressed is actually very simple. It all depends on what you pair it with, and one important styling trick is grounding the leggings outfit with the right shoes. Skip the sneakers this time around, and instead, slip into ankle booties. 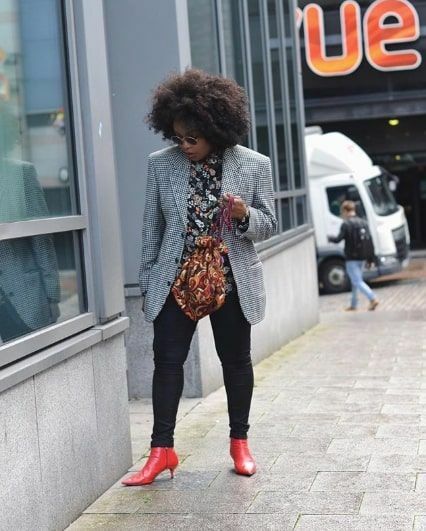 Ahead, we found all the best ankle boots with leggings outfits that you'll definitely want to work into your rotation ASAP, whether it's rocking an ever-versatile black pair with grungy combat boots or donning leopard-print leggings with crisp white booties. Read on to see the looks, and then shop our favorite leggings-and-ankle boots combo to wear now. Black leggings paired bright colored shoes looks instantly cool. Leather leggings are bound to be your new favorite bottoms. Pair them with red shoes for an added pop of color. The perfect NYE look? Yes. Leopard leggings are so on-trend. Pair them with white booties, too. Here's an easy ankle boot with leggings outfit to wear on repeat: black leggings with black Chelsea boots. Throw on a cozy cardigan and a chunky scarf to dress up black leggings. Try low-cut ankle boots instead. Jeggings are still a trend worth trying. Go for an all-over edgy look with black leggings and black combat boots. For a night out, rock patent-leather leggings with high-heel ankle boots. A subtle way to lean into the Western-inspired footwear trend. You can never own too many black leggings. Chunky white combat boots are a model favorite, too. You'll never want to part ways with these. Next up, shop the best faux-leather leggings of the season.